An ebel-what? 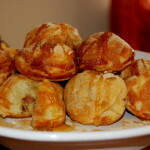 Ebelskiver. 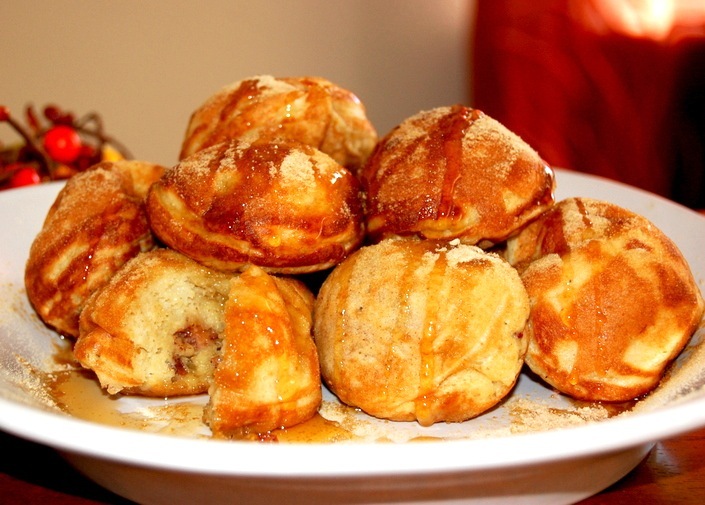 An ebelskiver is pronounced “e-bull-skive-er”, although, I’ve also heard other interpretations, as you can imagine. To me, they are pretty much “awesome!” The best part about the fall season are apples, which are the heart of this organic recipe. The smells coming from your kitchen will have you screaming for cool crisp air and trips to the orchard. I first learned of this breakfast, snack, dessert, (or dinner if you are a “breakfast for dinner” kind of guy or gal) from a friend of the family. My reaction mimicked the first sentence of this post, except perhaps with extra question marks! I was intrigued by this ebelskiver thing, so I did some investigating. First and foremost, these ebelskiver pans are easy to find thanks to the internet. Here’s my ebelskiver pan. After preparing the batter and pouring it into the pan, you will find after round 2 or 3 you will be a pro! One tip I saw on TV was to remember which ebelskiver indent you filled with batter first and go clockwise. This way, you will recall which ebelskiver will likely need to be flipped first. Keep It Going, You Are Almost There! Once each crater of the pan is filled about half of the way, throw a small dollop of the apple filling, but just enough so it doesn’t overflow the batter. Here’s another tip: you can toss in anything you want really. After just a few minutes, you will see the ebelskivers bubble at the top, similar to pancakes. Before flipping, check to see if the one side of the ebelskiver is able to lift itself from the pan using two wooden skewers, (or anything similar that won’t melt or scratch). It can be a bit of a balancing act, but with confidence and you can do it! When they are a light brown/golden color, gently, but quickly take the batter within the hemispherical indents and flip them over. Don’t worry if the first one didn’t turn out and flip all the way or if it doesn’t look quite “right” … because they’ll still taste great! When I first started to make ebelskivers, I followed the recipe to a “T”, however, I realized that the baker (you!) can make a lot of customizations, too! I haven’t experimented with any grain-free pancake batters, but I would say it’s worth a try! Be sure not to mix the ingredients too much as the batter may wind up creating a dense ebelskiver. The list could go on. But I’ll leave the experimenting up to you! The versatility of these ebelskivers is so great that eventually, you will master the sweet or savory ebelskiver. Homemade Powdered Sugar & Digging In! Strictly optional: Homemade powdered sugar is a nice sweet touch to include. Toss some sucanat into your coffee grinder and grind away! In just moments, you will have a delightful light powdery sweetener. Allow the ebelskivers to cool for several minutes. You may be tempted, but they may be too hot! Okay, now dig into these moist creations! These will make a great fall time dish to share with your friends and family during the holiday season. I hope you enjoy! Oh, one more thing…I haven’t gone wheat-free, grain-free, or gluten-free. There is so much controversial information to be heard from people through word-of-mouth or from the internet. Many people have to make changes to their diet because of how their bodies react to the grains/gluten. It’s important to listen to your body and feed what it needs in order to better you and your health. As we know, a lot of the food we eat today doesn’t always seem to be prepared the way we once thought, including wheat. I like the idea of incorporating ancient grains, however, I do like trying wheat free recipes, because they’re usually packed with other delicious and healthy ingredients. Perhaps, I am in denial and just truly want to continue baking my grandmother’s recipes. I recently celebrated her birthday, which consisted of casseroles and baked goods (all of which had wheat and gluten). 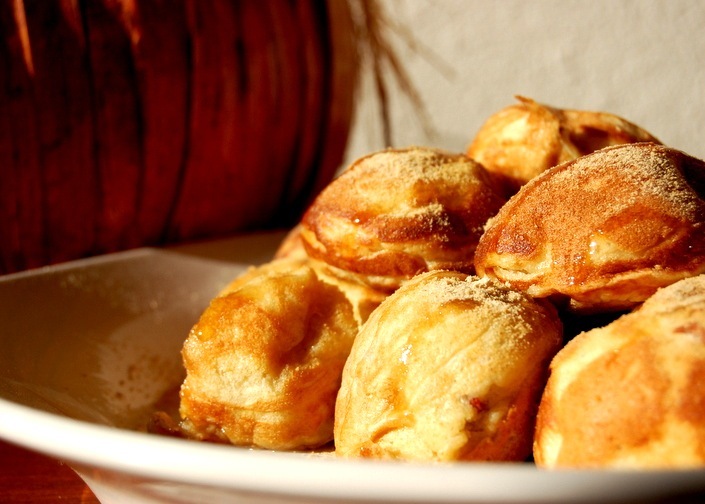 An ebelskiver to some is a “Danish pancake” (since they are a tradition in Denmark) and to others, they are “pancakes puffs.” Add apples for breakfast or dessert in the fall. 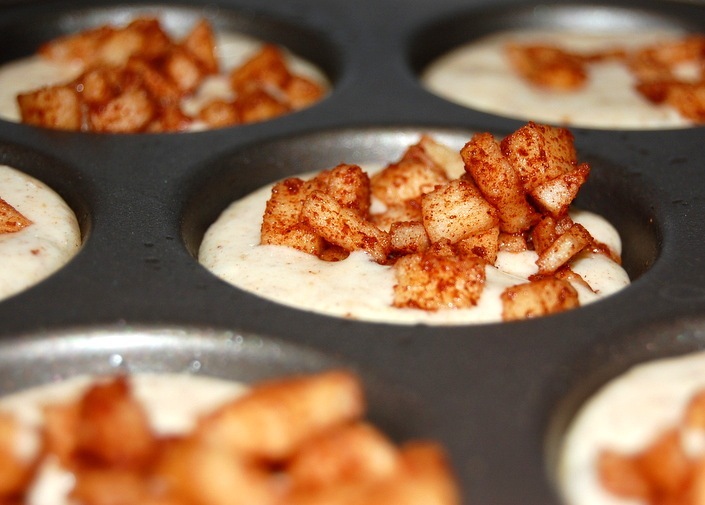 Cut apple into small chunks or use food chopper/processor to save time. Add a splash of lemon to apples and stir (to prevent browning). Heat stove top to medium. Using basting brush, saturate the indents of the ebelskiver pan with coconut oil and pour batter halfway into each crater of the ebelskiver pan. Add a dollop of the apple filling on top of the batter of each crater on the pan (or other filling of your choice) and pour batter to cover apple filling onto each crater. When the ebelskivers begin to bubble, flip them completely over using two wooden skewers (or anything similar that won’t scratch or melt). After about a minute or two, remove ebelskivers from the pan when they are a light brown/golden color. Feel free to add additional sweetener to the final product, if you need that extra kick. Allow to cool for a couple minutes before serving. Heat toaster oven to 375 degrees for 5-7 minutes. This recipe can be customized to all tastes. Experiment and find a filling you enjoy best! 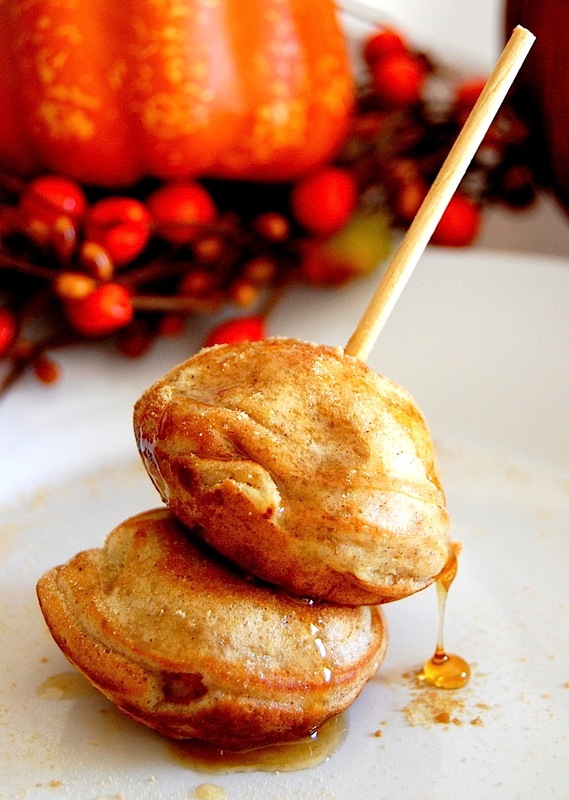 What are some of your favorite fall time treats? Can’t wait to try this Whitney! Thanks for another awesome post!! Using knitting needles is a great way to turn them (like the Danes do). And you get a more round puff if you first turn 1/4 way then come back and turn full instead of just flipping. You end up turning them constantly, starting with the first poured and going round til all turned. This is a standard meal in our danish home. I think almond flour would work the best. Coconut flour would be to dense and “toasted” quinoa flour would work, but the best flavor would hands down be almond flour/butter.